These recycled plastic planters have a clean and straight forward design. Constructed with recycled plastic lumber offers an environmentally responsible alternative. 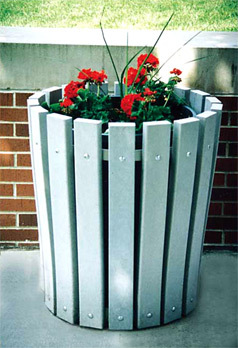 These planter provide quality and longevity for both commercial and residential settings. Made with 100% recycled plastic, these planters are guaranteed not to crumble, deteriorate or rot making it extremely low maintenance by any standards. Also, with molded-in color, they will never need painting. 15 Gallon Rigid Poly Liner Included. Model P-40S | 18"H x 28"Dia. Model P-40M | 24"H x 28"Dia. Model P-40L | 28"H x 28"Dia.